Welcome to the Coldwell Banker Carlson Real Estate market report; a 2015 Year-End examination of the real estate market in the Stowe area. This report uses market-wide data based on transactions that closed in 2015 in the Multiple Listing Service, and compares them to sales that took place during 2014. 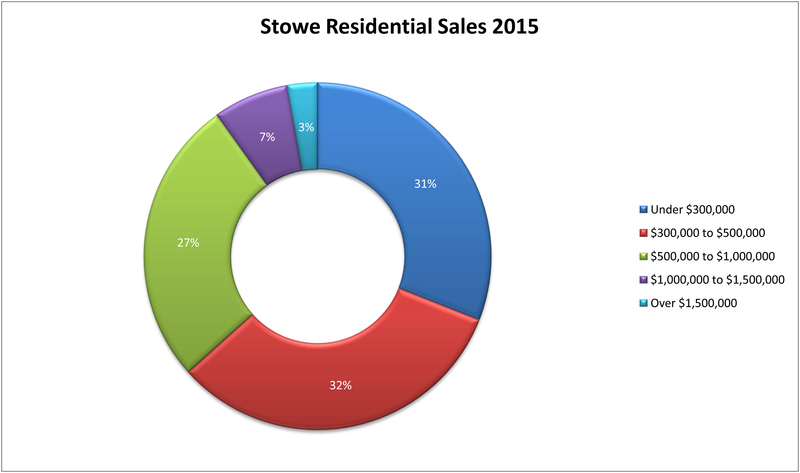 In 2015 the Stowe market generally reflects that of the broader market throughout Vermont, and much of the nation. Many analysts have reported a continuation of a “level-headed market”; much of which is probably due to very low levels of inventory. We are seeing one of the lowest levels of residential and land inventory, in recent memory. Most of which is seen in the lower price ranges. Despite these factors, the continuation of low interest rates, steady job growth, and buyer demand, should keep real estate sales heading in the right direction. Sales in general, show continued stability.